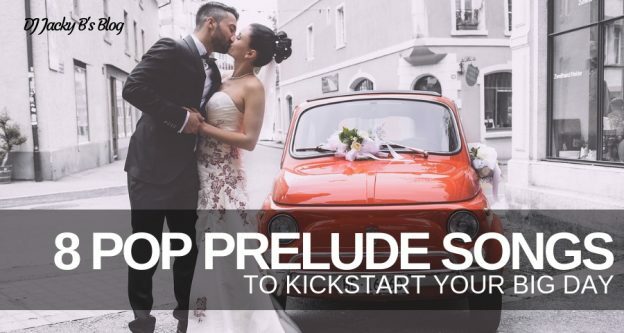 Wedding prelude songs are music to welcome your guests as they arrive to the ceremony. You can set the right mood by hiring a wedding DJ to greet family and friends with the appropriate songs for the occasion. Playing rhythm and blues (R&B) at a nuptial sets a soulful mood. The genre is ideal for wedding preludes as it combines poignant tones from gospel, jazz, and blues. Do you need suggestions? These selection should give you enough ideas to create your own playlist. This sweet song describes what it’s like to be in love in a very poetic way. When Kelly Rowland sang out, “Can you describe the moment when two people fall in love?” It will help convey to your guests what you feel towards your significant other. “When I first saw you, I already knew.” How do you know he’s the one? Let this song do the talking for you. If this song reached Number 1 in the US Billboard Hot 100, it will also touch the hearts of your guests. The song brings a happy and smooth beat that can curb the awkwardness between guests. Not to mention the poignant meaning behind the song as it talks about fighting for love through rough times. “As I stand here before my woman.” Bruno Mars shows what loving forever is like between married couples. The song is a reminder and a promise to love someone for the rest of their lives. This is one of the best romantic hits from the 90s you can request from your wedding DJ. Playing this song on the background lets you belt out on thanking God to have found the one you love. Nowadays, prelude music doesn’t have to be overly romantic or old fashioned sentimental love songs. Couples can put their spin on it, makings sure it reflect their personality and story. R&B tunes can help them achieve just that. Want more R&B prelude music? 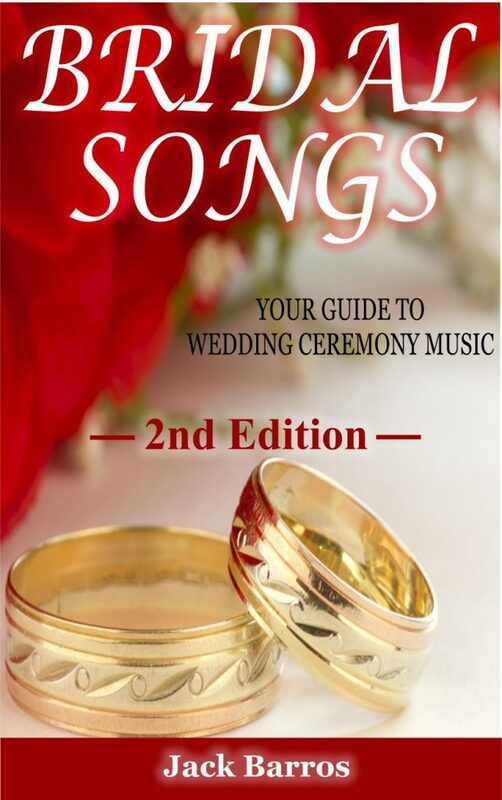 Grab your copy of Bridal Songs Your Guide to Wedding Ceremony Music 2nd Edition a one of a kind wedding ceremony music resource! Find the perfect song for your wedding celebration. You will find great wedding songs for all parts of your wedding ceremony from 11 genres of music. You can find songs easily as the songs are listed by genre, artist and song title. The book details the different parts of the American wedding ceremony. 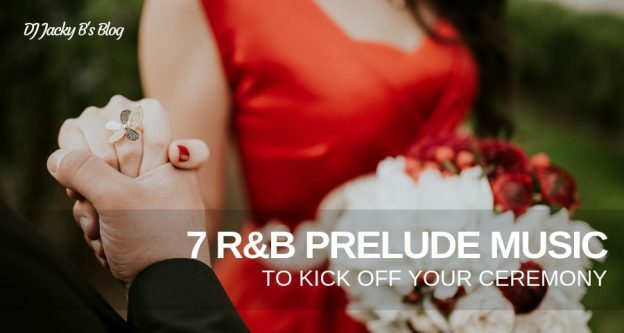 Is there a song you would use as a R&B Prelude Music at Your Wedding Ceremony? Love to hear it. Place any suggestions in the comments. This entry was posted in Wedding Ceremony, Wedding DJ, Wedding Recessional, Wedding Songs and tagged Professional Wedding Emcee & DJ, wedding ceremony, Wedding Ceremony Music, Wedding Music, Wedding songs on January 18, 2019 by Jack Barros. 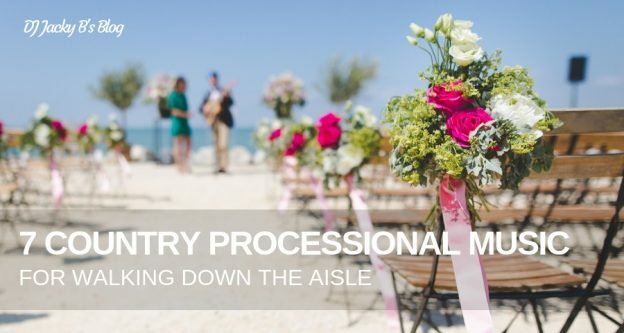 If your heart is set on having country music for your processional, we’ve got you covered. On this list, we have seven wedding-worthy songs you can ask your wedding DJ to play for your ceremony. This song is perfect for both processional and first dances during the ceremony. “I don’t dance, but here I am, spinning you around and around in circles.” It has that romantic country vibe, but with a poppier vibe. Taylor Swift can add a little more romance and fantasy to your wedding with the song, Love Story. The start is paced just right for the processional and there are a number of other versions of it that you can choose from as well. “I’m gonna be here for you from now on, this you know somehow.” The country song tells all with a promise of forever in your wedding day. If you want to announce your love and commitment to your spouse, you can convey that emotion with this song. Another wedding classic, your guests will get to feel the moment as you walk down the aisle. The opening lyrics, “From this moment life has begun,” tells everyone that you’re ready to start a new future—and to make it a good one as well. Whether you’re listening to John Michael Montgomery’s version or All 4 One’s, no one can deny that this song is solemn and pure. When the singer croons, “I’ll be there for better or worse, ‘til death do us part,” it sounds like a vow already. To make your wedding more memorable, ask your wedding DJ to add a few note-worthy country songs to the list. A romantic country spin during your processional will have guests moving with tears. Want more country processional music songs? Grab your copy of Bridal Songs Your Guide to Wedding Ceremony Music 2nd Edition a one of a kind wedding ceremony music resource! Find the perfect song for your wedding celebration. Is there a song you would use as a country processional wedding recessional song at Your Wedding Ceremony? This entry was posted in Wedding Ceremony, Wedding DJ, Wedding Recessional, Wedding Songs and tagged Professional Wedding Emcee & DJ, Wedding Ceremony Music, wedding DJ, wedding dj tips, wedding information, Wedding Music, Wedding songs on January 11, 2019 by Jack Barros. Are you planning on having your wedding in a church? If this is so, you’ll have certain limitations on what you can play for your wedding. Ask your wedding DJ to play it safe, without going too plain with some good ole’ classical pieces. Classical music provides failsafe options for a traditional wedding. But it doesn’t have to be boring. If you don’t know how to choose, let this list of classical wedding processional songs inspire you. The classic, “Here Comes the Bride” march, gives you that regal feeling of when God unites your union. It might be a popular piece of music, but given that there are a variety of versions available, you can choose one that suits your preferences the best. Canon is the most popular bridal entrance in weddings! This soft tune is a favorite classical melody is almost a must for ceremonies. Most couples change this piece to different versions to make it more refreshing. For instance, the rock guitar Canon in D is a crowd pleaser just as much as the original. The trumpet sounds and blasts from violins in the intro will certainly add a grand statement to your entrance. Mendelssohn has created a rather heavenly piece of music that will surely place all the focus on the bride and the ceremony itself. Bach’s rendition of Ave Maria has a soft and pure tune perfect for bridal marches. If you can find an opera or wedding singer who can sing it for you, you’ll understand why it’s a top pick for an entrance. If you want a more uplifting tune for your entrance, this piece would be ideal for a joyous celebration. It can set the right mood for everyone waiting for your arrival. If you want something more subtle, but no less dreamy, then this is the song for you. It gives a light, almost floaty feeling to the ceremony. Adding a romantic touch to everything. Also, you can hear this classical track on slow dances between children and their parents. If you want a regal and grand entrance, Handel’s Royal Fireworks is a good choice to celebrate such a happy occasion. Or, you can use this piece for your recessional as well. Do you want to stay conventional yet memorable with your choice of music? 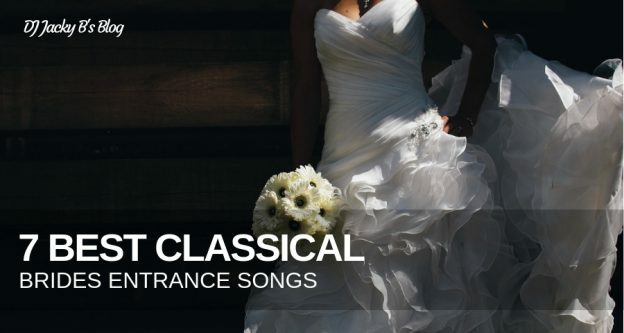 This classical playlist is what you can suggest to your wedding DJ. Want more classical brides entrance songs? Grab your copy of Bridal Songs Your Guide to Wedding Ceremony Music 2nd Edition a one of a kind wedding ceremony music resource! Find the perfect song for your wedding celebration. Is there a song you would use as a classical wedding recessional song at Your Wedding Ceremony? This entry was posted in Wedding Ceremony, Wedding DJ, Wedding Recessional, Wedding Songs and tagged Professional Wedding Emcee & DJ, wedding ceremony, wedding ceremony songs, wedding DJ, wedding dj tips, wedding information, Wedding Music, Wedding songs on January 4, 2019 by Jack Barros. The wedding DJ plays the postlude music after the minister or pastor gives the benediction. Imagine this: you and your sweetheart have just said “I Do” and have officially tied the knot. Now, you don’t want silence as you and your wedding party go out of the ceremony. Nor do you want your guests to leave without any music playing on the background. It could be awkward. Sebastian Temple’s “All That I Am” is a perfect Christian postlude. It is a dedication song—a promise of offering one’s life for the glory of God. The words, “All that I am…I do…I’ll ever have… I offer now to You” is a spoken commitment of the newlyweds in the form of song. What a great declaration, “Take and sanctify these gifts for your honor, Lord”. Simple and heartfelt—that’s what you want your postlude to be. A #1 on the Gospel Songs chart, the song “Close To You” is a duet by Bebe and Cece Winans. The siblings are American Gospel singers who have received many Grammy nominations and awards. The song is an affirmation that no one can undo what God has done for one’s life until the end of time. It is a song of the faithfulness of the Lord and the desire to be close to Him. This is a good choice to conclude a solemn ceremony. “Everything Glorious” is a song by the contemporary Christian band, David Crowder Band. The lyrics go, “The day is brighter here with You, the night is lighter than its hue…. You make everything glorious.” A great way to close the ceremony is through a song that declares the Lord makes all things splendid and beautiful. It won’t be just for the couple, but an inspiration for everyone in attendance. If you prefer a power ballad to rock the conclusion of your wedding ceremony, then choose “Honestly” by the Christian metal band Stryper. The lyrics are deeply touching and express commitment: “I will never betray your trust in me…I love you honestly”. It’s about human friendship—and friendship is one of the key ingredients to a great marriage. It is also a song about the love and faithfulness of God. In “Say Once More”, Amy Grant sings, “..time can’t erase this look of love on your face… my life will always be richer.. here with you..” You can consider this postlude as either secular love song or a love ballad to God. Let your wedding DJ play “Say Once More” if you are looking for a Christian postlude that doesn’t have explicit Christian lyrics. 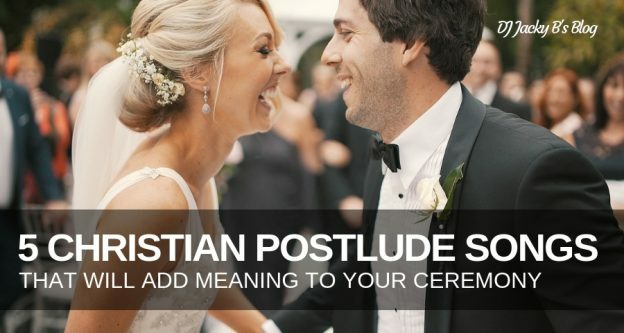 There are more of these Christian postlude wedding songs in my book “Bridal Songs: Your Guide to Wedding Ceremony Music 2nd Edition.” There’s a whole selection of music for other parts of the wedding too. Grab your copy of Bridal Songs Your Guide to Wedding Ceremony Music 2nd Edition a one of a kind wedding ceremony music resource! Find the perfect song for your wedding celebration. Is there a song you would use for Christian Postlude Songs? This entry was posted in Wedding ceremony music lists, Wedding DJ, Wedding Recessional, Wedding Songs and tagged Professional Wedding Emcee & DJ, Rock wedding songs, Wedding Ceremony Music, wedding DJ, wedding dj tips, wedding information, Wedding Music, wedding reception, wedding recessional songs, Wedding songs, Wedding Tip on December 7, 2018 by Jack Barros. As your guests arrive and settle down before the ceremony, you want your wedding DJ to play background music to keep them entertained and happily waiting for the entourage to march down the aisle. There are no strict rules on what music to play right before your wedding ceremony, but the songs should be appropriate to the occasion. They should reflect the couple’s personality. They should also not be played too loud that conversation is difficult. “A Thousand Years” by Christina Perri is a touching song. The singer elaborates on her love for her spouse: “I have loved you for a thousand years”. She declares, “I’ll love you for a thousand more”. The exaggeration of the commitment of time serves as proof of passion. It’s a great background music while guests are waiting for you to make an appearance. There is no greater hit that will make your guests dance a bit than “I Do (Cherish You)” by 98 Degrees. Just imagine: “I do cherish you, for the rest of my life, you don’t have to think twice” playing on the background. The music and lyrics are enough to spark a sense of excitement at the vow of forever. The opening lyrics “Your hand fits mine like it’s made just for me” is catchy. The song “Little Things” by One Direction is another hit single that is perfect for a pop prelude to your wedding. It talks about all the little things that add up and makes you love your significant other. Looking for a song about the happiness that true love brings? Choose “Everything” by Michael Bubble. Playing this song on the background will inspire your guests about the real love that makes life worthwhile. It’s a smooth song—with an acoustic guitar and a piano carrying the main melody. The lyrics ”in this crazy life… these crazy times.. you make me sing… you’re everything” will move everyone. Kelly Clarkson belts out “Some people wait a lifetime for a moment like this..” in this stirring song. “Moment Like This” is a perfect choice of music to show your guests how thankful you are that you have found your forever mate. Listening to this song played by your wedding DJ while waiting for the wedding party to enter will make them dream of their own special moment. Jason Derulo’s “Marry Me” starts off with the number of years that the singer wants to be with the one he loves. It is a lovely song as it declares “the more I look, the more reasons I find why you’re the love of my life.” What a sweet pronouncement of love and commitment, thinking about the future. It’s a great song to kick off your ceremony. Is there a song you would use for Pop Prelude Songs? This entry was posted in Wedding ceremony music lists, Wedding DJ, Wedding Songs and tagged Professional Wedding Emcee & DJ, Rock wedding songs, Wedding Ceremony Music, wedding DJ, wedding dj tips, wedding information, Wedding Music, wedding reception, wedding recessional songs, Wedding songs, Wedding Tip on November 30, 2018 by Jack Barros.